Hope everyone is having a nice weekend and had a great Valentine's Day! My husband surprised me with some beautiful flowers! We also went out for an early dinner which was yummy!! I'm linking up with Teaching Trio with my Sunday Scoop! 3 things I HAVE to do: *I'm working on a St. Patrick's Day TpT product and I am almost finished!! I would like to have it posted today! *Yep, we definitely have a mountain of laundry to fold! Have to do that today! *Stay WARM!! It is soooooo cold outside! 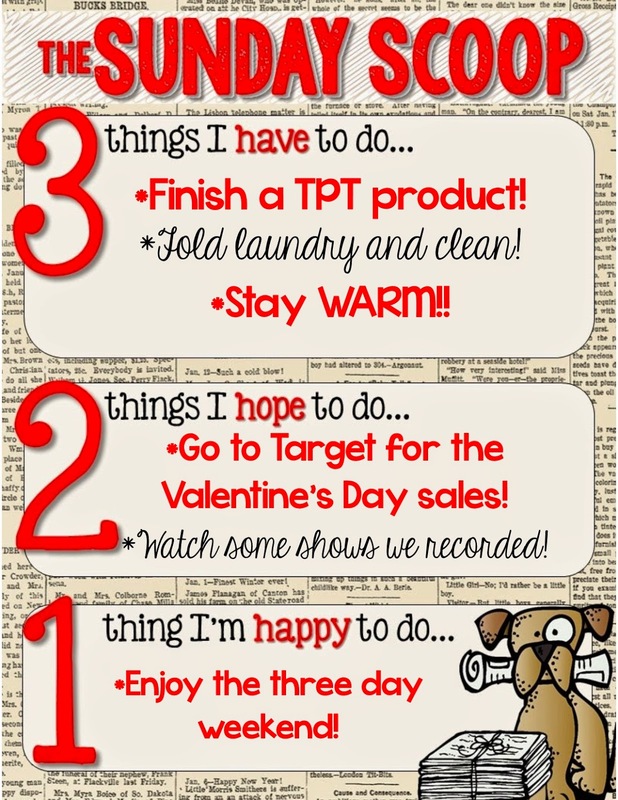 2 things I HOPE to do: *Even though it's soooooo cold outside, I would still like to venture out to Target! I love looking through the after holiday sales! Plus, I need some candy hearts for a math activity we are doing this week! *We have a few shows recorded I hope to catch up on! We have been recording Celebrity Apprentice and I also have a Hallmark movie (no surprise there!) recorded that I would like to watch! 1 thing I'm HAPPY to do: *Enjoy the three day weekend! !